Imagine watching a magical performance by David Copperfield. Rather than dazzle you with his breathtaking acts, Copperfield regales you the audience with his childhood story. He relates how his grandfather – a crusty old man – never gave Copperfield or his father the approval they craved. Suddenly, the room goes quiet. As Copperfield shares how his father’s early dreams of acting were dashed, replaced with becoming a lingerie salesmen, you’re transported inside the story. Copperfield next describes how magic helped him overcome his shy gawky youth. How he persevered despite his grand dad’s prediction that he would be a failure. And lastly, how he missed the chance to say goodbye when his grandfather died. With a beginning like, the audience would be doubly spellbound – not just with the tricks but the magic of Copperfield’s personal story. That, according to Peter Guber, is the power of Tell to Win. Crafted from his decades of experience as Chairman and CEO of Mandalay Entertainment, Sony Pictures, Polygram and more, Tell to Win guides us on the art and science of storytelling as a tool for business. By employing these techniques, we could “move beyond soulless PowerPoint slides, facts and figures to create purposeful stories that can serve as powerful calls to action”. The first part of the book – There’s No Business Without Story Business – paints the backdrop for storytelling. To be vehicles for emotional transportation, stories need to have characters and heroes that people can relate to, drama to move the heart, and “Ah ha!” moments that click. Understanding the contexts of one’s audience is key, and so is empathy. We should also take control of our own backstory and leverage the backstories of our listeners and viewers. c) an ending with a resolution that ignites a call for action from the listener. Preparation is the key to success. Demonstrate authenticity and congruence, show that you’ve got “skin in the game”, and emotionalise your offerings to resonate with your listeners. Understanding who your audience is – their backgrounds, interests, prejudices, and contexts – is vital here. Next, identify who your heroes are. They can be you (the teller), the listener, customer, product, location, tribe, or any other entity so long as they’re appropriate for the goal. Personal or witnessed experiences provide the best raw material for the story, while metaphors and analogies fuel the imagination of listeners. You should also leverage powerful narratives from the information obtained, books, movies, and history to transport your audience emotionally to your call for action. To tell the tale, you should get into the right mental and emotional state. High energy levels are critical here. Bring forth vivid experiences to your audiences, demonstrate vulnerability (where appropriate) and be so persistent that you can change a “no” into an “on”. To capture audience attention, be mindful of what messages your body language is conveying. Be interactive, engage their senses, arouse curiosity, listen actively, and be willing to drop the script should the occasion call for it. Surrender control of your story such that your audience owns it (and is willing to tell it forward). If necessary, deploy the right props, tools and resources. 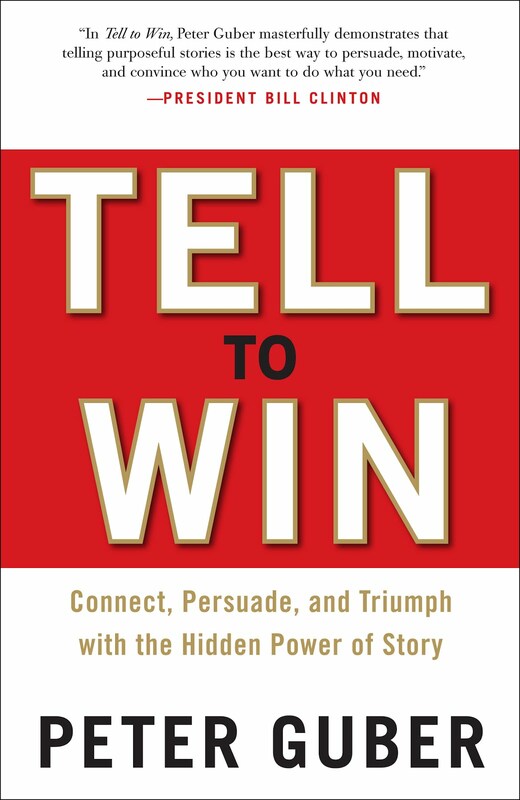 The most powerful feature of Tell to Win are its vivid case studies overflowing with the “Who’s Who” in entertainment, politics, sports and media. They include former US President Bill Clinton, Wally Amos (of Famous Amos Cookies), Oprah Winfrey, Magic Johnson, Muhammad Ali, Carl Sagan, Michael Jackson, and many more. Collectively, these voices lent great credence to Guber’s ideas. They also made the learning points more memorable and impactful. Towards the end of the book, Guber acknowledges that storytelling technologies like blogs, YouTube videos, Facebook, Twitter and other social platforms could change how storytelling evolves. However, nothing beats face-to-face telling. 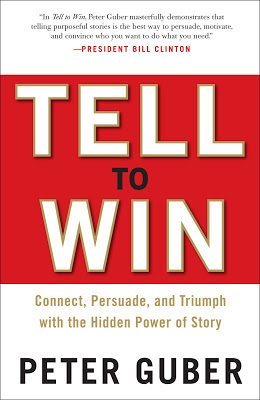 In summary, Tell to Win is highly recommended for anybody keen to craft, deliver and own stories that can move audiences to become “passionate advocates” for their goal. Written in an engaging narrative itself, the book is a compelling read that strikes a chord with its readers.